Have you ever looked at pictures of Saturn's rings and noticed what look like gaps in the rings? You're not the first! Gian Domenico Cassini discovered a large gap in Saturn's rings in 1675. Later, an astronomer named Encke discovered a smaller gap near the edge of the rings. What causes these gaps? Well, the rings are not solid, but composed of a vast number of tiny particles, most of which are plain old water ice. These chunks of ice are very small; most are probably only centimeters across! Each chunk orbits Saturn individually, like a swarm of billions of moons. It was found long ago that an orbit in the Cassini Division, as the large gap is named, has a period almost exactly one-half that of one of Saturn's moons named Mimas. This means that every other time a chunk of ice orbits Saturn in the Cassini Division, it would see Mimas in the same position in the sky. Mimas has a pretty good mass, which means it has substantial gravity. Over millions of years, this periodic tug has yanked all the particles out of that region in Saturn's rings. The Encke division, on the other hand, is the result of a direct sweeping of a small satellite located inside the gap. It actually pulls particles out of its way as it orbits Saturn, leaving a gap in the rings! I remember when I was a kid, thinking about Mimas clearing a gap. I thought to myself, "What if a particle has an orbit one-third of Mimas' period? Would it get cleaned out too? How about one-fifth, or tenth?" 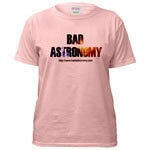 Oh, how I wish I had asked a professional astronomer! When the Voyager probes went to Saturn, they discovered that the main rings of Saturn are actually divided into thousands of tiny ringlets! I could have been famous! Oh well. Who wants to have something named after them that isn't there? If you are ever looking for info on anything in the solar system, you should always start at Bill Arnett's Nine Planets site. An excellent summary of science done by the Voyager missions can be found courtesy of the Jet Propulsion Laboratory. More good Saturn ring information can be found at the National Air and Space Museum's Saturn page.